International observers have called for action following accusations that China has been arresting leading Tibetan writers, poets and musicians in a crackdown on cultural figures, as The World Tonight's Paul Moss reports. The lyrics of the song are not exactly subtle: "The occupation and denial of freedom of Tibetans/This is torture without trace." Another sounds a note of defiance: "Courageous patriotic martyrs/Have sacrificed their lives for Tibet/It pains my heart thinking of them/And the tears fall from my eyes." "Tashi Dhondup reflected the trauma that Tibetans were feeling," said Dechen Pemba, a London-based blogger. "The police came to his home and his wife was begging with the police officers - they're a young couple with a newly-born baby. But he was arrested and taken away." Tashi Dhondup was not alone. 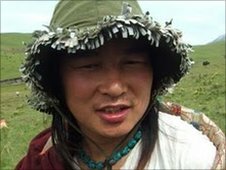 Prominent Tibetan environmentalist Karma Samdrup was jailed last week for 15 years. And according to a report by the International Campaign for Tibet, more than 50 writers, poets and musicians have been rounded up over the past few months. Many have received tough sentences and, according to the campaign's spokeswoman Kate Saunders, many were people not usually regarded as dissidents. "They're being... taken from their homes in the middle of the night," she said. "These are individuals who are politically moderate, often secular, and yet the Chinese authorities are seeking to silence them." But despite clear challenges to Beijing's authority, Robbie Barnett, director of Columbia University's Modern Tibetan Studies programme, said the Chinese government itself may not be behind the arrests and prison sentences. He believes that over-zealous local officials were the more likely instigators: "Local officials make their own minds up about who they're going to crack down on. "They don't care about international responses. They may have an interest in being much more heavy-handed," he said. Another writer who has been on the receiving end of this treatment is Shogdung - he was arrested in April and campaigners have not heard from him since. Shogdung's case is particularly pointed, as he had previously been seen as loyal to the Chinese government - he had criticised Tibet's version of Buddhism - and had said the Tibetan people needed to sort out their own problems. It contained a scathing denunciation of Chinese rule: "My flesh is petrified, my bones hurt. They have made everyone helpless and desperate. In daytime, they run like jackals. "At night, they sneak in like bandits.... we have been beaten, seized, arrested, condemned, sentenced, massacred. They have made us unable or afraid to move, to speak, to think. Everything and everyone has become inert because of fear." "He was clear he was heading for trouble," she said. "But I'm not really sure he'll cope very well with detention. Although he looks very strong, I think he's more the fragile type." 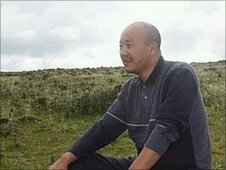 The Chinese Embassy in London has refused to comment on Shogdung's case, or on the arrest and detention of any other Tibetans. Hear more in a full report by Paul Moss on BBC Radio 4's The World Tonight.